Assistance League founder, Anne Banning, always felt that it was fine to serve youth, but better to let youth serve. Today Assistance League is proud to continue to encourage and provide volunteer opportunities for today’s youth. 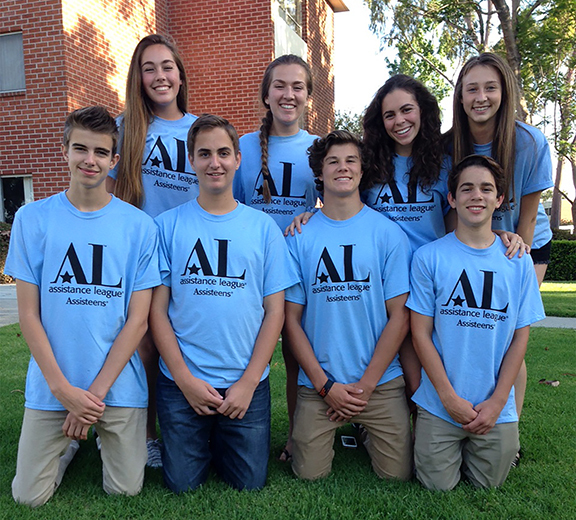 Assisteens of Temecula Valley was formed in 1992 and membership is open to boys and girls in grades 7-12. The aims of participation are to develop a sense of community responsibility, self-reliance, personal responsibility, poise, public speaking and leadership skills. Develop an awareness of the needs of others through community service. Develop and foster leadership and self-reliance. Develop and promote personal responsibility with strong ethics and values. Introduce new experiences to stimulate intellectual growth and cultural appreciation. Assisteens’ raise money to fund their philanthropic programs by staffing the thrift shop counter on designated Saturdays. Peter Rabbit – An event held off site for Temecula & Murrieta Head Start preschool children. Includes petting zoo, train rides, egg hunt, treats, games, a new book, and pictures with Peter Rabbit and Eyore. Operation School Bell® Support – Financial support of Assistance League’s Operation School Bell program. This program provides new school clothing to identified at-risk children in Southwest Riverside County. Membership is open all year for teens in grades 7 through 12. The Assisteens year is from June 1 through May 31. Assisteens are required to serve a total of 30 hours per year. Meetings are held the second Wednesday of each month (except July, August & December). Social activities are determined by grade level. The Annual Meeting is held in May; Awards, Installation of Officers and Senior Recognition. In June, Assisteens have the opportunity to participate in an Assisteens conference enabling teens from across the country to share ideas with each other.